The Cretan Bull was a legendary beast of Greek mythology. As the name suggests, the Cretan Bull was originally from Crete, although it would later travel throughout Ancient Greece, and it was a also a beast encountered by both Heracles and Theseus. The Cretan Bull is first found on the island of Crete, although there is no mythological birth story connected with the animal; instead, the Cretan Bull was first observed when it emerged from the Mediterranean Sea onto the Greek island. The Cretan prince Minos had prayed to Poseidon to provide a sign that he was the rightful successor to King Asterion, and Poseidon answered Minos’ prayers, by sending forth a magnificent white bull from out of his realm. The Cretans saw the bull and perceived it to be a sign that Minos was in favour with the gods, and so Minos did become King of Crete. Now, Minos was expected to sacrifice the magnificent white bull to his benefactor Poseidon, but in a lapse of judgement, King Minos instead decided to sacrifice an inferior bull in its place. Minos so admired the animal that he wished it to be part of his herd, although whether he expected Poseidon not to notice the substitution, or not care about it, is unclear. Poseidon though, did notice the substitution, and did care about it, and in retribution, Poseidon caused the love that Minos had for the Cretan Bull to be passed to Minos’ wife, Pasiphae. This meant that Pasiphae fell physically in love with the Cretan Bull, and lusted after it. Pasiphae though, had no way to satisfy her lust for the Cretan Bull, and so the Queen of Crete had to enlist the help of Daedalus, the legendary craftsman. Daedalus crafted a hollow cow into which Pasiphae hid, allowing the Cretan Bull to mate with Pasiphae. The copulation of the Cretan Bull and Pasiphae would cause the wife of King Minos to fall pregnant with a child, a half-man, half-bull creature, that although named Asterion, would be far better known as the Minotaur. After mating had occurred between Pasiphae and the Cretan Bull, Poseidon cause the animal to go mad, and subsequently the Cretan Bull would rampage through the Cretan countryside, causing much damage, and killing those who got too close. It was to Crete that King Eurystheus sent Heracles for the demi-god’s Seventh Labour; Heracles being tasked with bringing the Cretan Bull back alive to Mycenae. King Minos was only to happy to see Heracles come to Crete to rid his kingdom of the beast that was causing so much damage. Compared to the Nemean Lion or the Lernaean Hydra, the Cretan Bull was no opponent for Heracles, and the demi-god overcame the strength of the bull, by wrestling it, and choking it into submission. Now after King Eurystheus saw that Heracles had succeeded in bringing back the Cretan Bull, he planned to sacrifice the beast to his benefactor, the Greek goddess Hera. Hera though, did not wish to receive a sacrifice because of the work of her nemesis Heracles, and so the beast was either released, or else it escaped. Subsequently, the Cretan Bull would travel to Sparta, through Arcadia, across the Isthmus of Corinth, and into Attica, as far as Marathon. At Marathon, the bull stopped its wandering, and instead caused damage to property and people, just as it had done in Crete; thereafter, the Cretan Bull would be known as the Marathonian Bull. The king of Athens at the time was Aegeus, son of Pandion, who was now faced with the problem of the troublesome beast, just as King Minos had been. None from Athens who went against it survived the encounter. Some tell of Aegeus then sent Androgeus, the son of King Minos, to kill the Marathonian Bull, for Aegeus had observed the prowess of Androgeus during the Panathenaic Games, and believed that the Cretan might be able to rid his land of the bull. The athletic ability of Androgeus though, was not enough, and the Marathonian Bull gored Androgeus to death; and it was this death that saw Crete go to war with Athens, and Athens’ subsequent defeat, and tribute payment. Later, another athletic youth arrived in the court of Aegeus, this youth being the long lost son of Aegeus, Theseus. Aegeus did not recognise his own son, but the Aegeus’ new wife Medea did, and fearful that her own son, Medus, might now not succeed to the Athenian throne, plotted the death of Theseus. Aegeus was therefore convinced by Medea to send the stranger against the Marathonian Bull; Medea being convinced this would result in Theseus’ death. 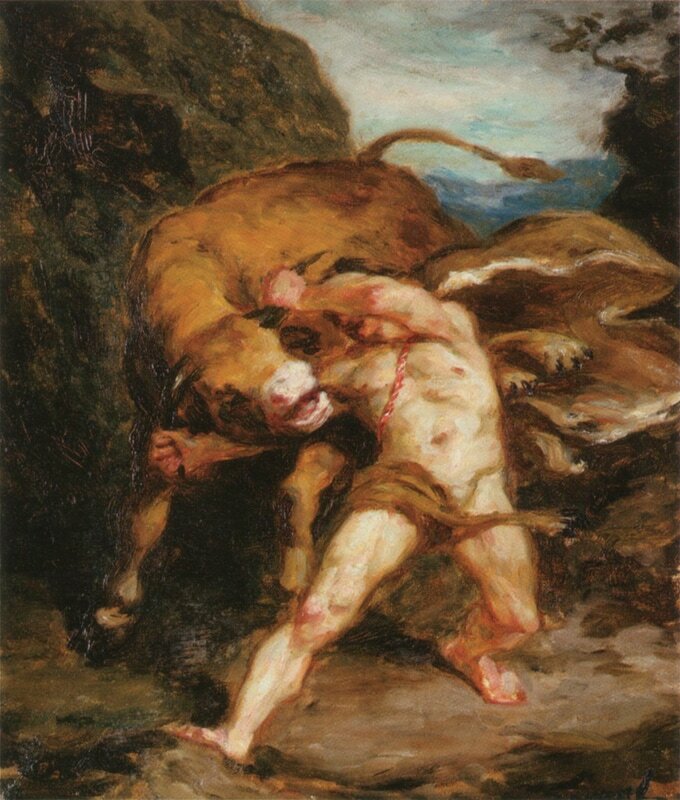 Theseus though, was advised by Hecale to make a sacrifice to Zeus before facing the bull, this Theseus did, and so the hero was able to wrestle the Marathonian Bull into submission. Theseus then drive the bull back to the Acropolis, where the Greek hero sacrificed it to the goddess Athena, many years after it should have been sacrificed. Thus the life of the Cretan Bull ended in Athens. Some tell of how the Cretan Bull, or Marathonian Bull, being placed amongst the stars as the constellation Taurus, although other bulls from Greek mythology, are also given as the origin myth for Taurus. Theseus would of course later travel to Crete where he killed the offspring of the Cretan Bull, the Minotaur, killing it with the Labyrinth beneath the palace of King Minos.